When a PhD researcher, Alba Fedeli, looked more closely at these pages it was decided to carry out a radiocarbon dating test and the results were “startling”. The university’s director of special collections, Susan Worrall, said researchers had not expected “in our wildest dreams” that it would be so old. These tests provide a range of dates, showing that, with a probability of more than 95%, the parchment was from between 568 and 645. “They could well take us back to within a few years of the actual founding of Islam,” said David Thomas, the university’s professor of Christianity and Islam. Prof Thomas says the dating of the Birmingham folios would mean it was quite possible that the person who had written them would have been alive at the time of the Prophet Muhammad. “The person who actually wrote it could well have known the Prophet Muhammad. He would have seen him probably, he would maybe have heard him preach. He may have known him personally – and that really is quite a thought to conjure with,” he says. 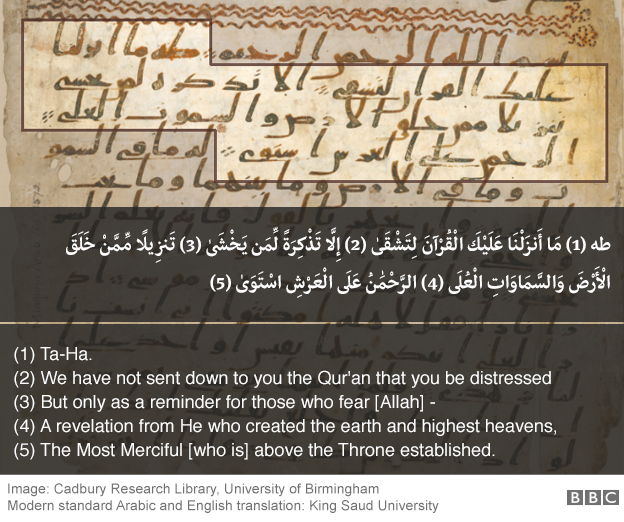 Prof Thomas says that some of the passages of the Koran were written down on parchment, stone, palm leaves and the shoulder blades of camels – and a final version, collected in book form, was completed in about 650. He says that “the parts of the Koran that are written on this parchment can, with a degree of confidence, be dated to less than two decades after Muhammad’s death”. 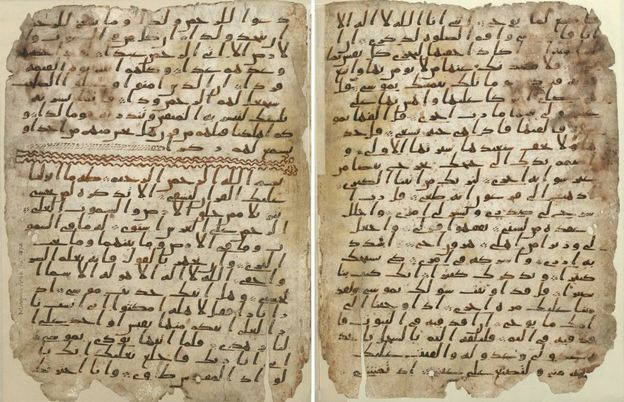 The manuscript, written in “Hijazi script”, an early form of written Arabic, becomes one of the oldest known fragments of the Koran. But the latest possible date of the Birmingham discovery – 645 – would put it among the very oldest. Dr Waley, curator for such manuscripts at the British Library, said “these two folios, in a beautiful and surprisingly legible Hijazi hand, almost certainly date from the time of the first three caliphs”. The first three caliphs were leaders in the Muslim community between about 632 and 656. Dr Waley says that under the third caliph, Uthman ibn Affan, copies of the “definitive edition” were distributed. Dr Waley suggests that the manuscript found by Birmingham is a “precious survivor” of a copy from that era or could be even earlier. The manuscript is part of the Mingana Collection of more than 3,000 Middle Eastern documents gathered in the 1920s by Alphonse Mingana, a Chaldean priest born near Mosul in modern-day Iraq. He was sponsored to take collecting trips to the Middle East by Edward Cadbury, who was part of the chocolate-making dynasty. “When I saw these pages I was very moved. There were tears of joy and emotion in my eyes. And I am sure people from all over the UK will come to Birmingham to have a glimpse of these pages,” said Muhammad Afzal, chairman of Birmingham Central Mosque. Prof Thomas says it will show people in Birmingham that they have a “treasure that is second to none”.